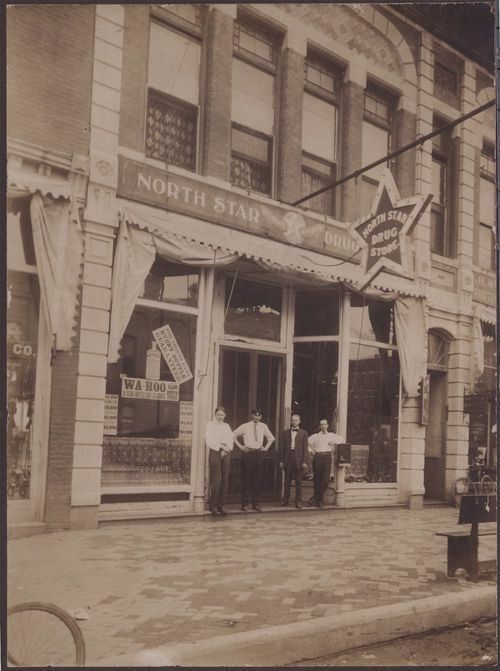 These photographs show exterior and interior views of the North Star Drug Store in Salina, Kansas. The first photograph shows an exterior view of the store with four men standing in front of the doorway. They are identified as Emil Lagbach, Bill Cacher (son of Dr. Cacher), A. Lagbach (assistant), and Mister Nelson (druggist). The sign above the doorway includes the traditional mortar and pestle pharmacy symbol, and also has the words "Svensk Apotek," identifying the store as a "Swedish pharmacy." Signs in the window advertise "Wa-Hoo Blood and Nerve Tonic." The second photograph shows an interior view of the store with employees and customers visible in the picture. A display case with boxes of cigars is visible on the left. A table with newspapers and magazines on it is visible in the middle, with other tables and chairs behind it. A soda fountain service counter is visible on the right. Signs above the shelves advertise cigars, perfumes, photo supplies, rubber goods, prescriptions, stationery, and candy.